September is a time for celebration as Foxtel presents an exciting new chapter of A Place to Call Home, starting from Sunday, September 13 at 8.30pm EST. The season two finale features the highly anticipated and never-before-seen ending – and these final minutes will change everything. On the weekend of Saturday, September 19, and Sunday, September 20, go back to where it all began with marathons of seasons one and two from 10.30am. Then, on Sunday, September 20, at 7.30pm EST, SoHo presents the one hour special event An Audience with the Cast of A Place to Call Home. The cast will field questions from a studio audience and the special will also take viewers behind the scenes and give insights into the much-loved cast and characters. Foxtel is pleased to formally announce that A Place to Call Home Season 3 will debut on Sunday, September 27 at 8:30pm EST only on SoHo. Lauded by critics and loved by millions of viewers, A Place to Call Home has cemented its place in TV history and people’s hearts. Created by Bevan Lee (Packed to the Rafters, Winners and Losers, Always Greener) the sweeping romantic drama is set in 1950s rural Australia and follows the lives of the Blighs, a wealthy and complicated pastoralist family, who live in Inverness, New South Wales. Season 3 also introduces some new faces to the town of Inverness; with Tim Draxl (A Few Best Men), Brenna Harding (Puberty Blues), Mark Lee (Paper Giants Magazine Wars), Rick Donald (House Husbands) and Robert Coleby (House of Hancock) joining the cast. 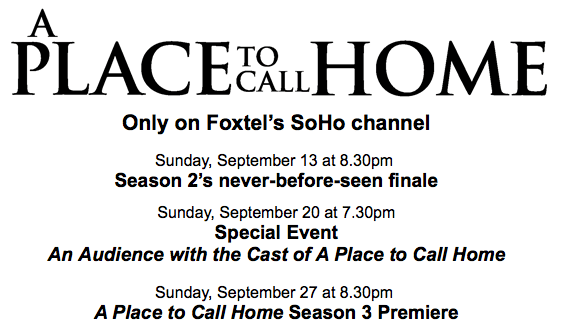 A Place to Call Home Season 3 premieres Sunday, September 27 at 8.30pm EST only on Foxtel’s SoHo channel.